Class charts are just that – for the class, the whole class. They capture your teaching and provide a resource for children when they need a quick reminder, a guide for how to do something, or an exemplar to view as a model. We have talked about ways to make charts interactive with the use of post-its and making smaller table-top versions or individual copies for kids folders or book baggies. While all these options have been used successfully, there are always children who need something else, a variation, or a complete new kind of chart. Turning charts into tools that can match individual needs is one way to do this. Marjorie recently worked with some first grade teachers at PS 256 in the Bedford Stuyvesant section of Brooklyn who were trying to figure out some ways to get the kids rereading their books repeatedly without just repeatedly reading each and every book in the exact same way. The whole purpose of multiple reads of a text is that both fluency and comprehension improve. In other words, the reading gets better. How to solve the problem then of when a small group of students don’t seem to understand the value in rereading their books multiple times and therefore not progressing as readers? For this small group of children something else was needed. The teachers and Marjorie came up with the idea of teaching the children a routine for rereading that laid out a different focus for each time a book was read. They came up with five different ideas for rereading a book. A first read was usually figuring out the words, the second read was often to smooth out the reading, the third time was to look more closely at the pictures adding to their understanding of what the book was about, the fourth time was to read with expression, matching one’s voice to tone and mood, and lastly rereading to post-it important parts worth thinking and talking more about. 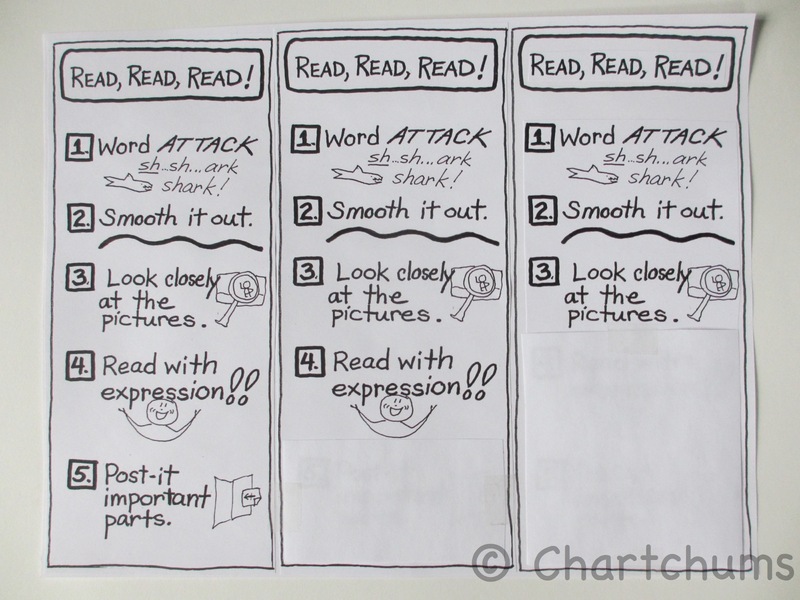 Marjorie then sketched out a bookmark with these five ways to reread a book. The teachers immediately thought that all their students could benefit from such a support, but for some children, five ways might be too much. Variations were made by simply removing some of the options, so that there was one kind of bookmark that had only three ways and one that had four ways to reread a book. Also, how the children used the bookmarks could be adjusted depending on needs. For example, in one class there were a few children who would benefit from rereading each book three times in a row and using a paper clip to keep track and prompt them to keep going. Another class thought the sliding paper clip idea might work for all the children and make it feel like a game. Individual bookmarks printed on card stock with paper clips that slide up and down. 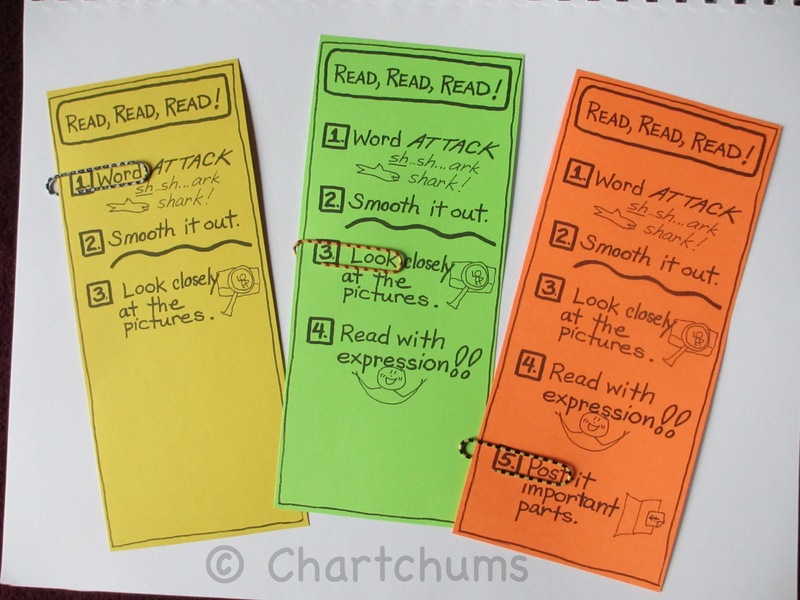 The bookmarks became helpful tools to put into each child’s hands and set them up to take on more ownership of their reading and responsibility for rereading with intention and purpose. And each bookmark could quickly and easily be adjusted depending on needs and reading levels. Any chart can be transformed into a tool and even more importantly, be customized for each student.